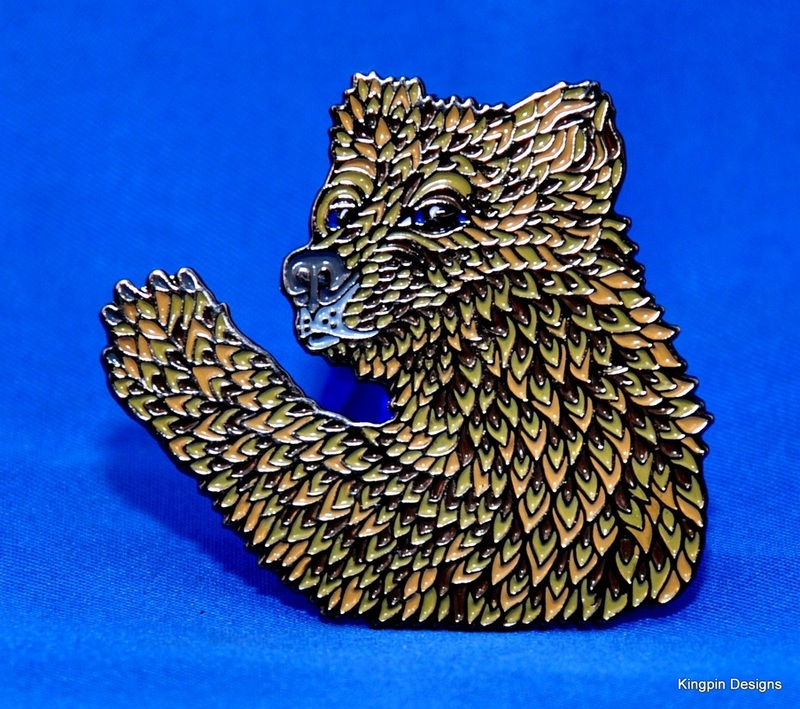 All pins are soft enamel pins, pressed and finished on polished black nickel, numbered and limited to 400 in each design. 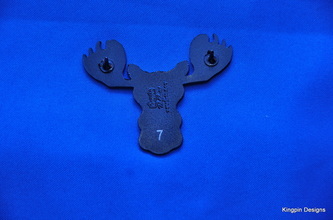 Sets are sold as matching numbered sets, and can be purchased with a gift box for an additional $5. 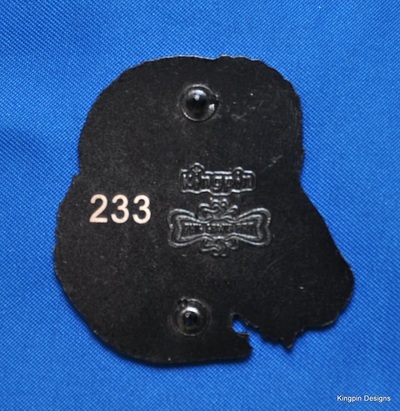 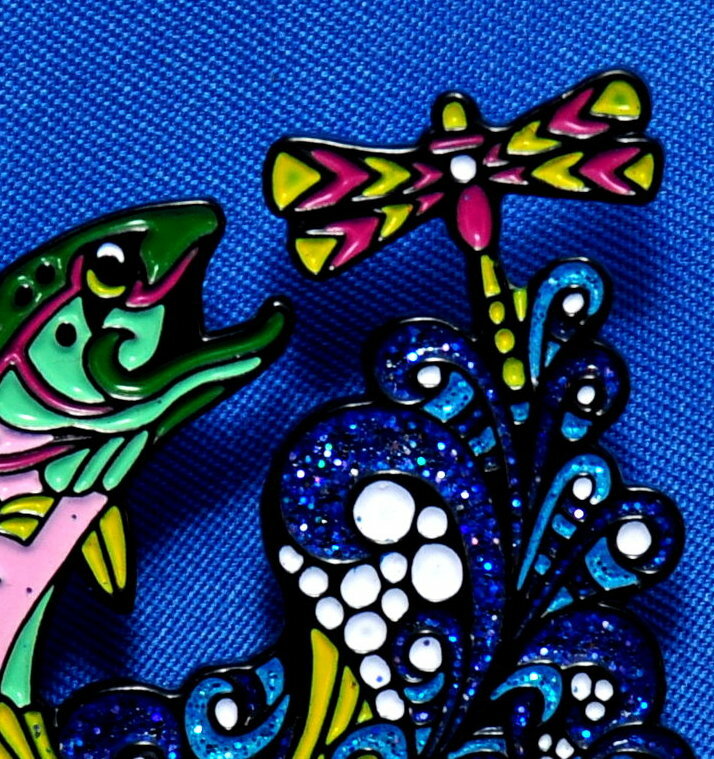 Unfortunately I can not fulfill requests for specific numbers, as these pins will be sold in a first come, first serve manner, with the lowest numbered set available going to the first order and so on. 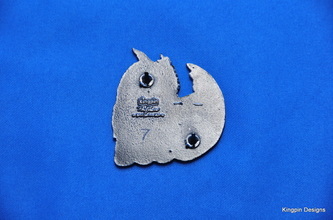 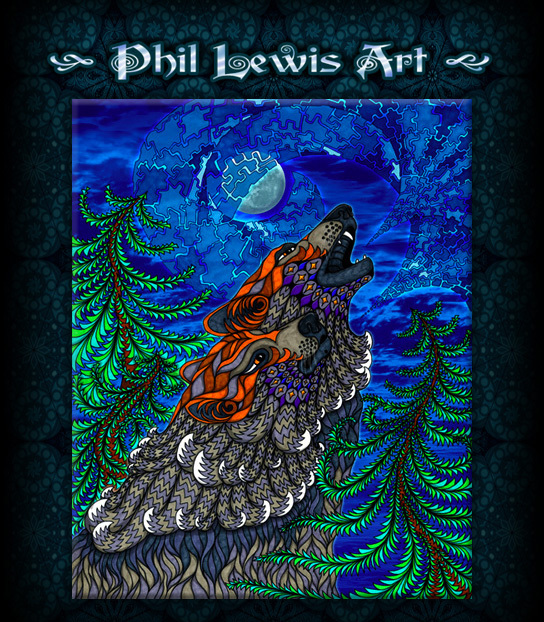 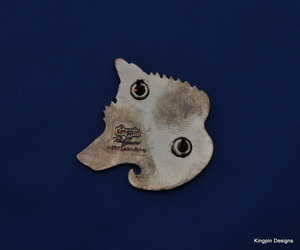 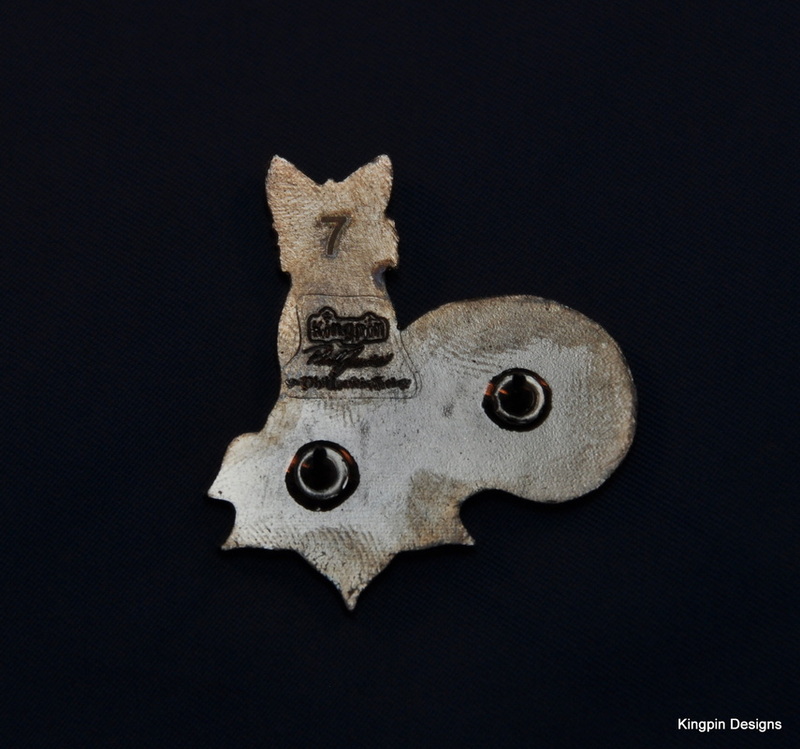 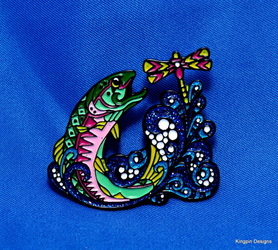 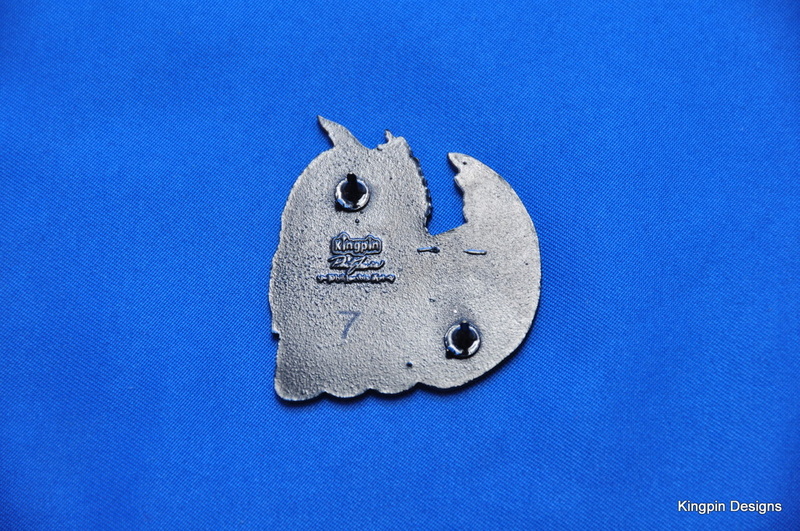 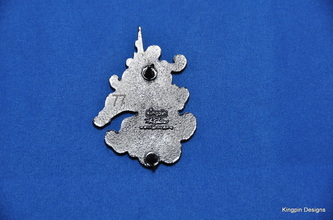 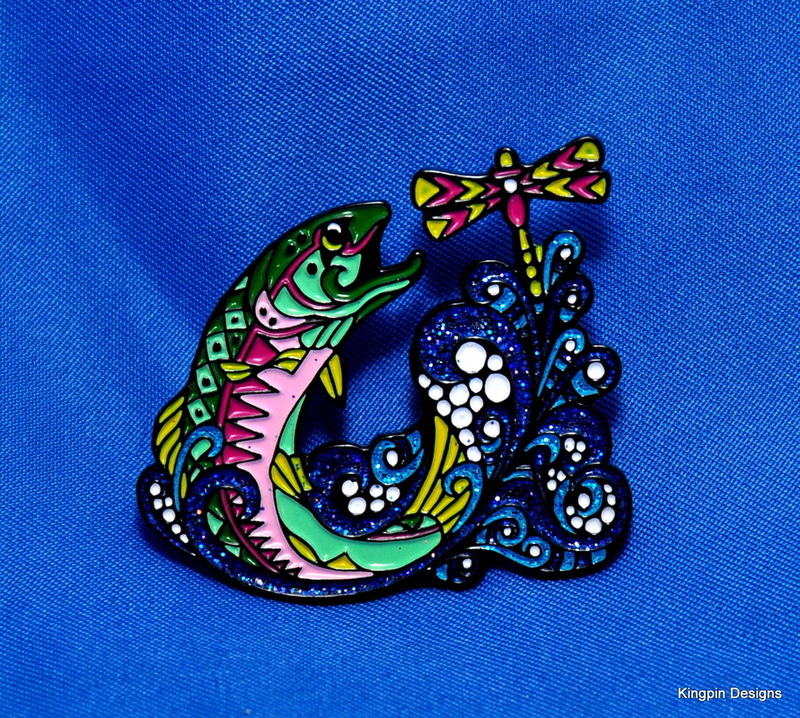 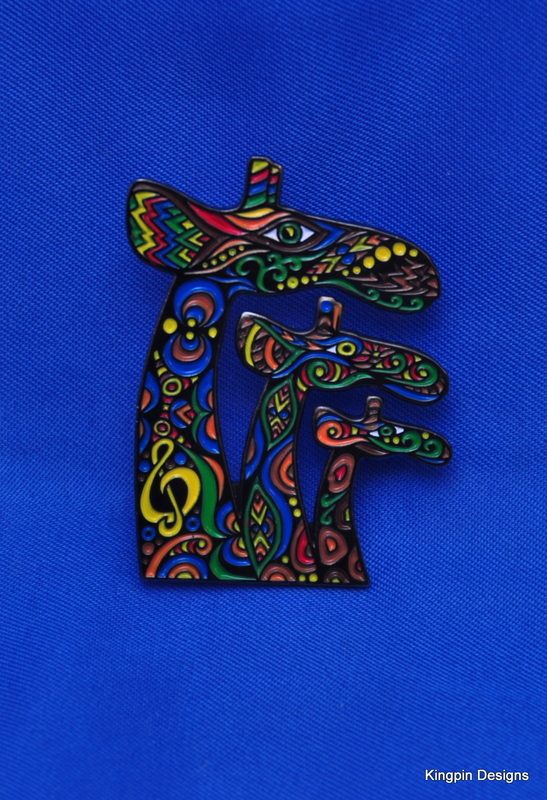 Each pin or set of pins comes with a certificate of authenticity verifying that it is officially licensed and produced under mutual agreement with Phil Lewis. 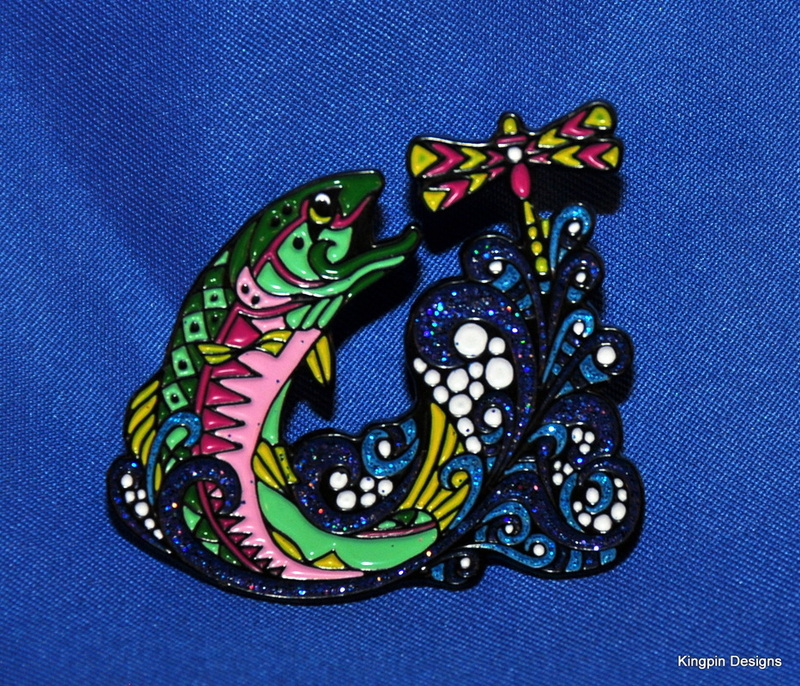 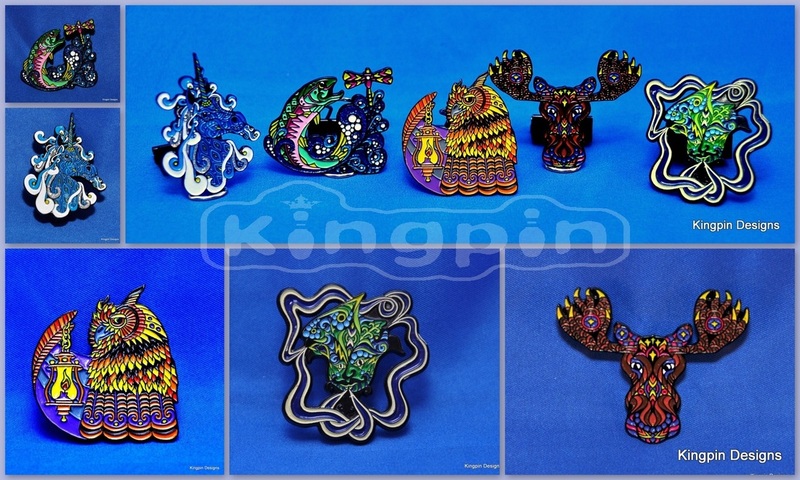 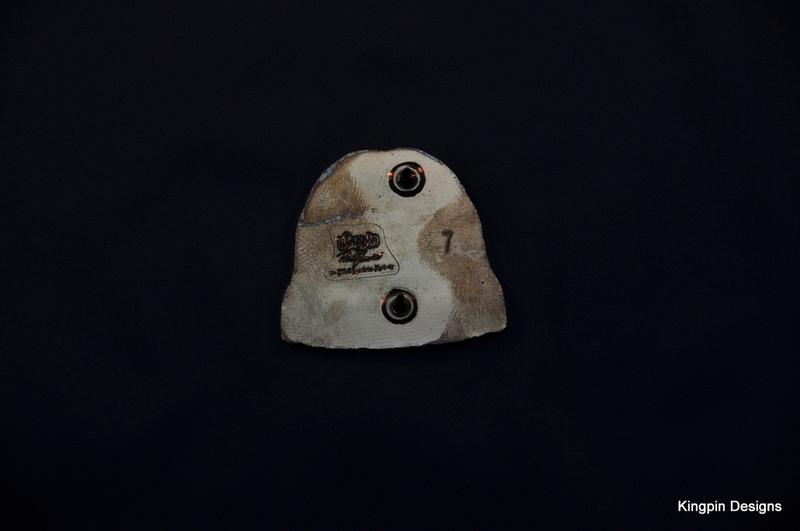 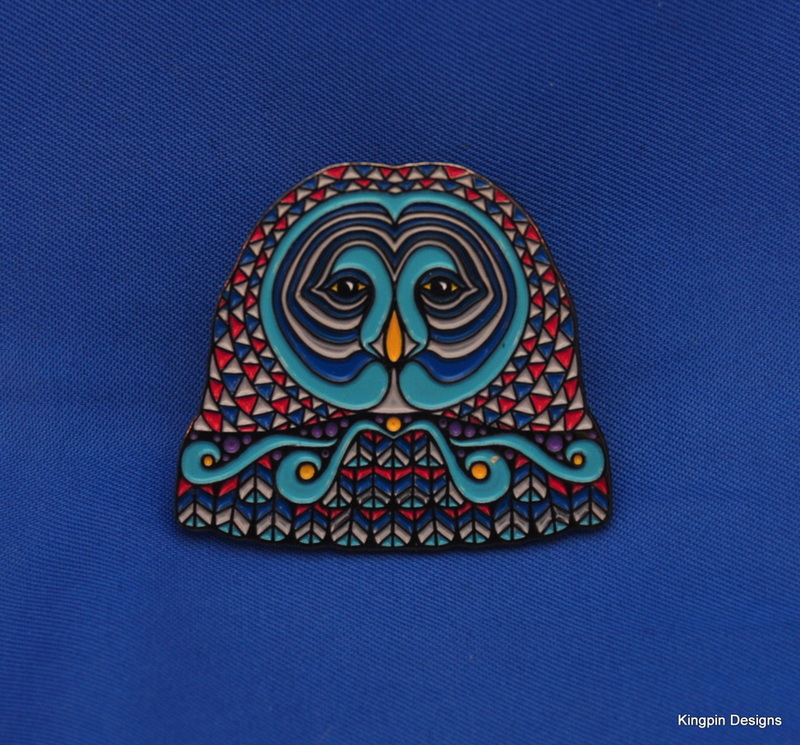 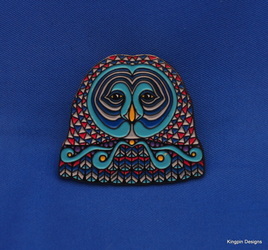 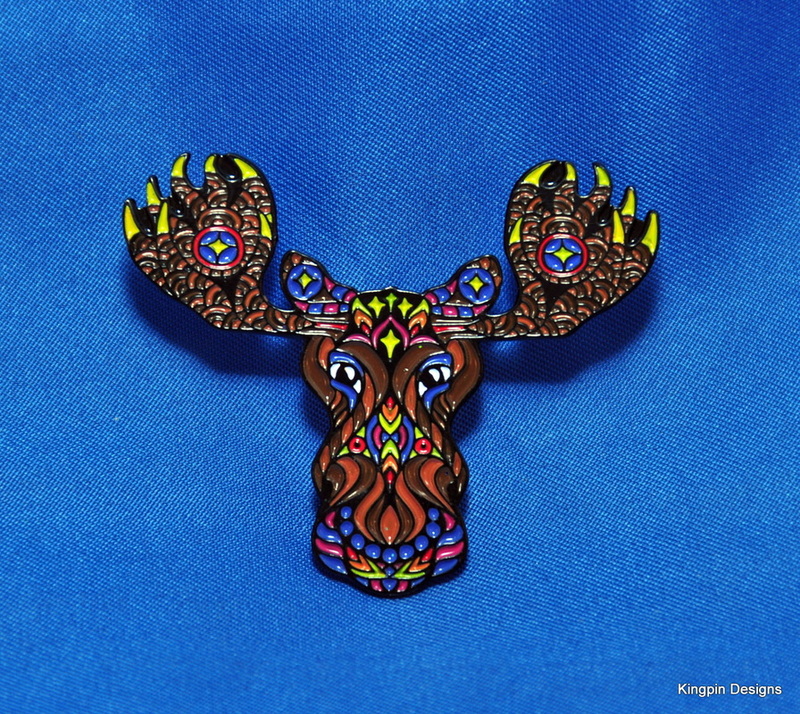 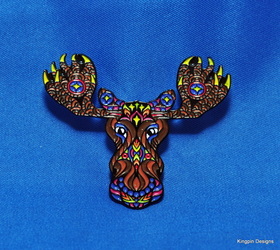 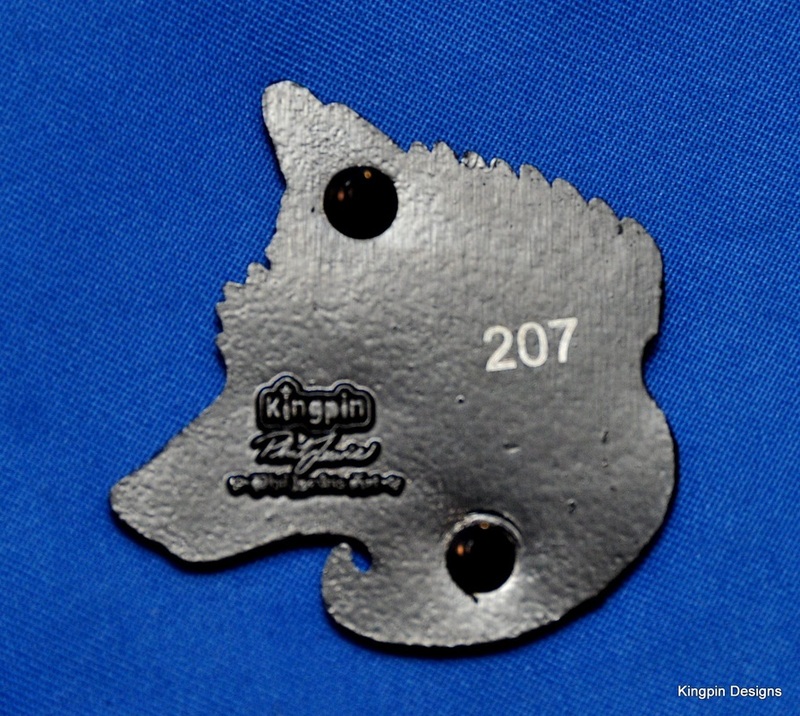 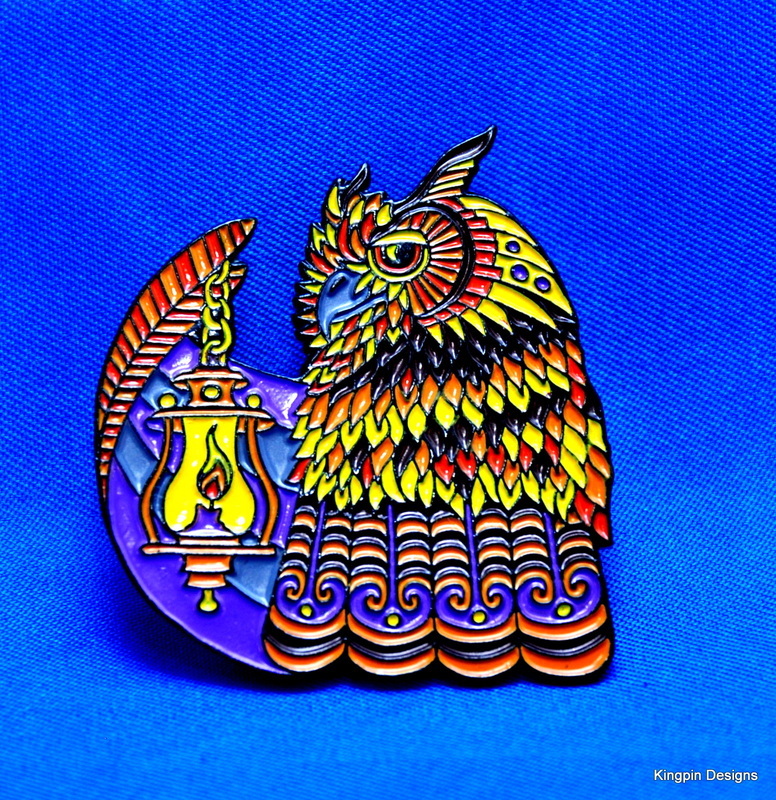 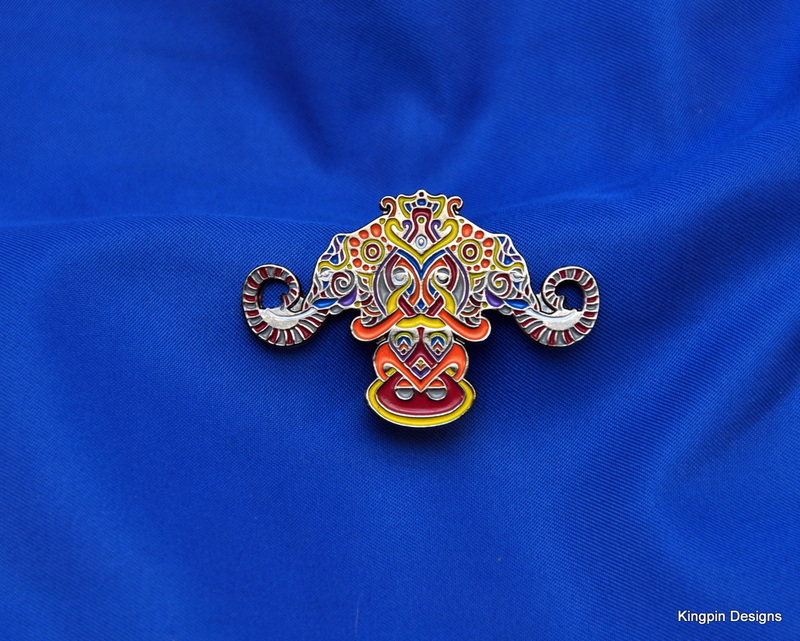 All pins have 2 backs and are stamped with Phil Lewis's signature, the Phil Lewis Art logo, the Kingpin Designs logo and are individually numbered. 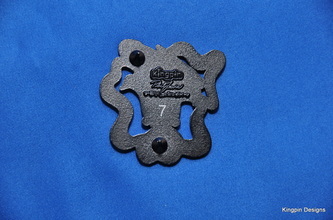 A black velour gift box can be added for an additional $5 by selecting the "Gift Box Option" below. 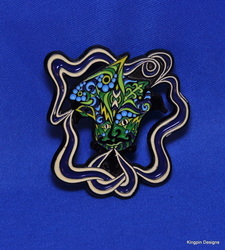 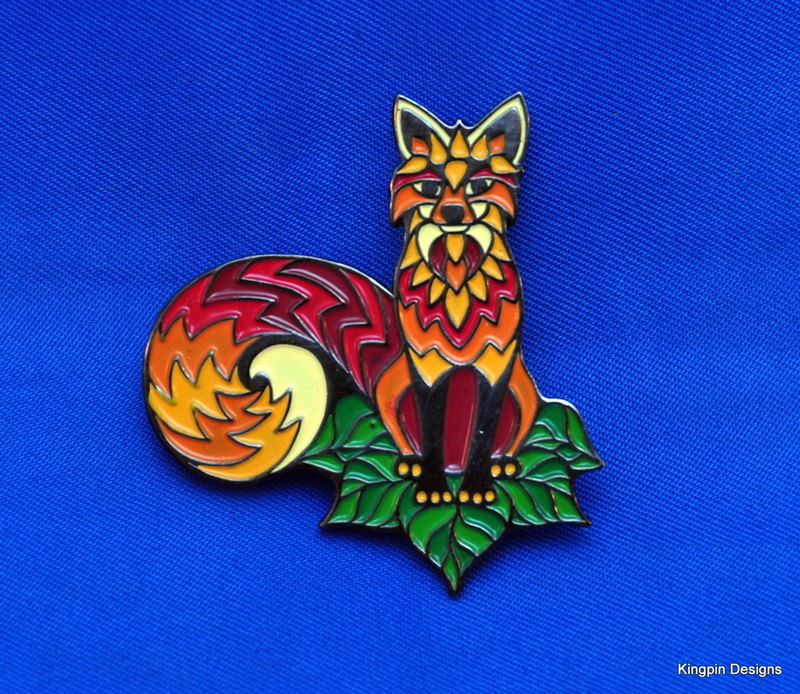 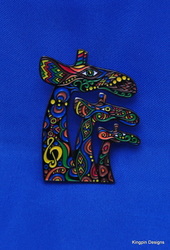 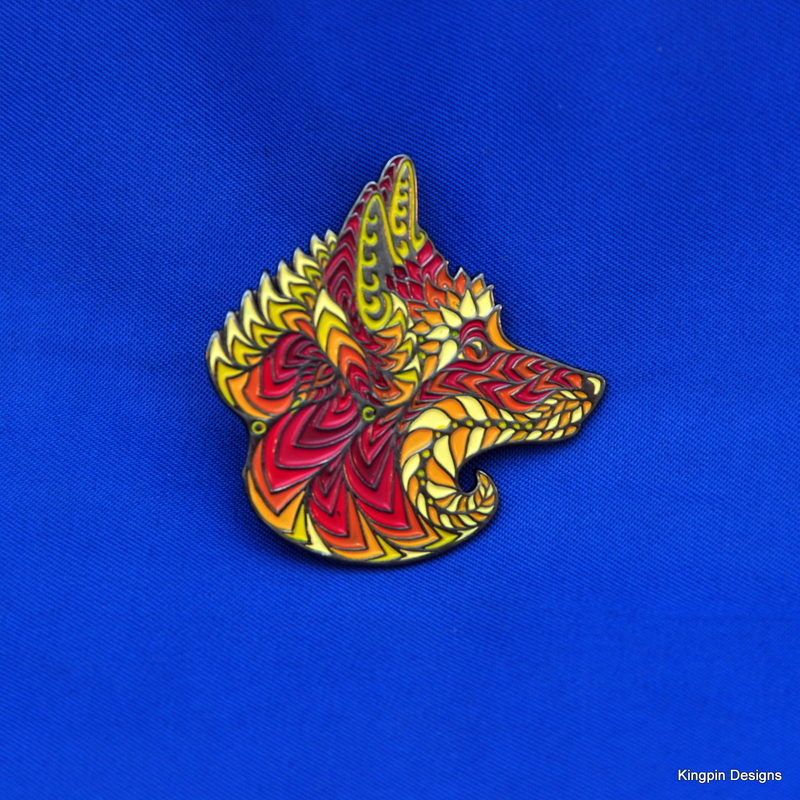 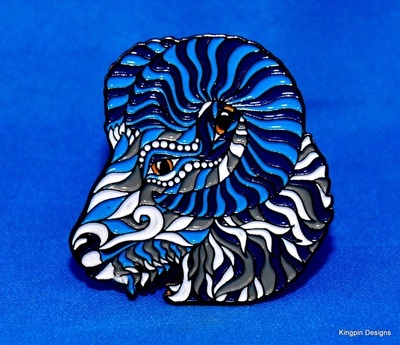 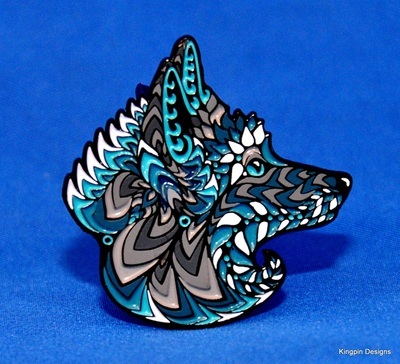 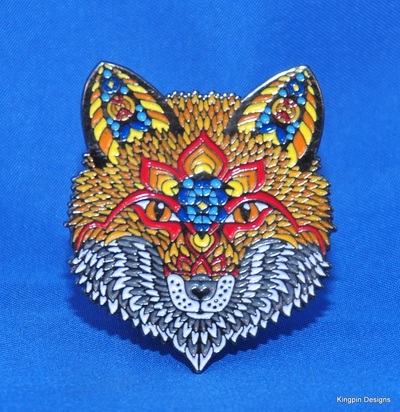 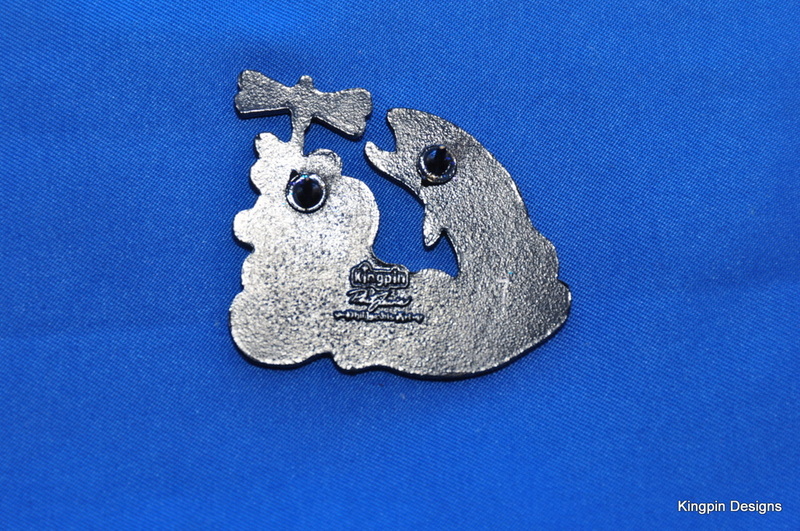 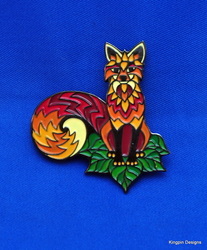 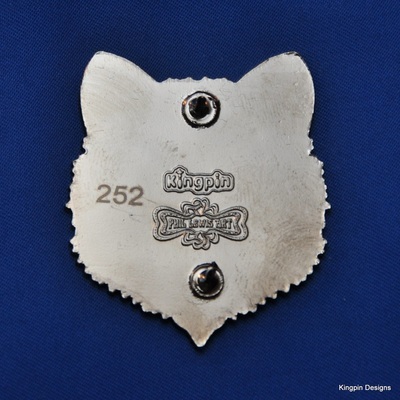 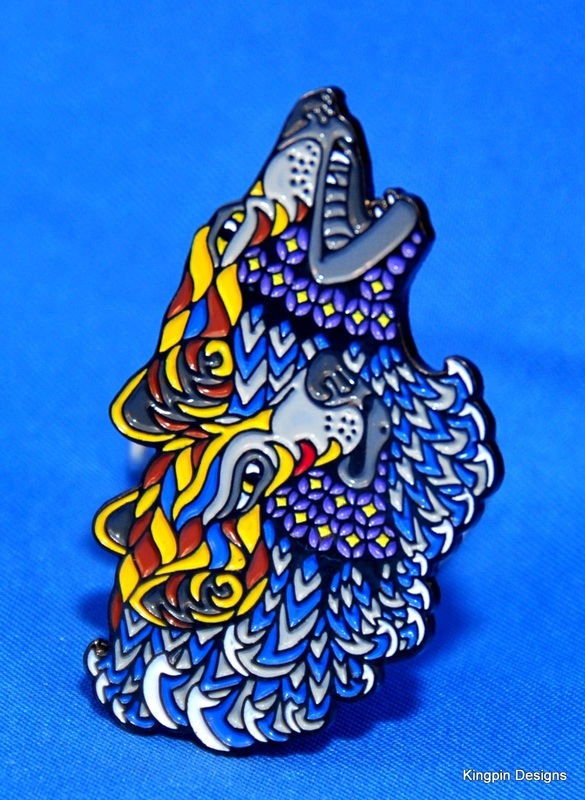 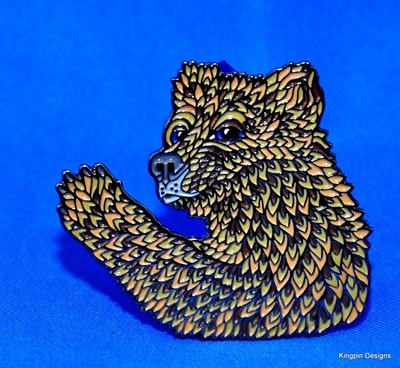 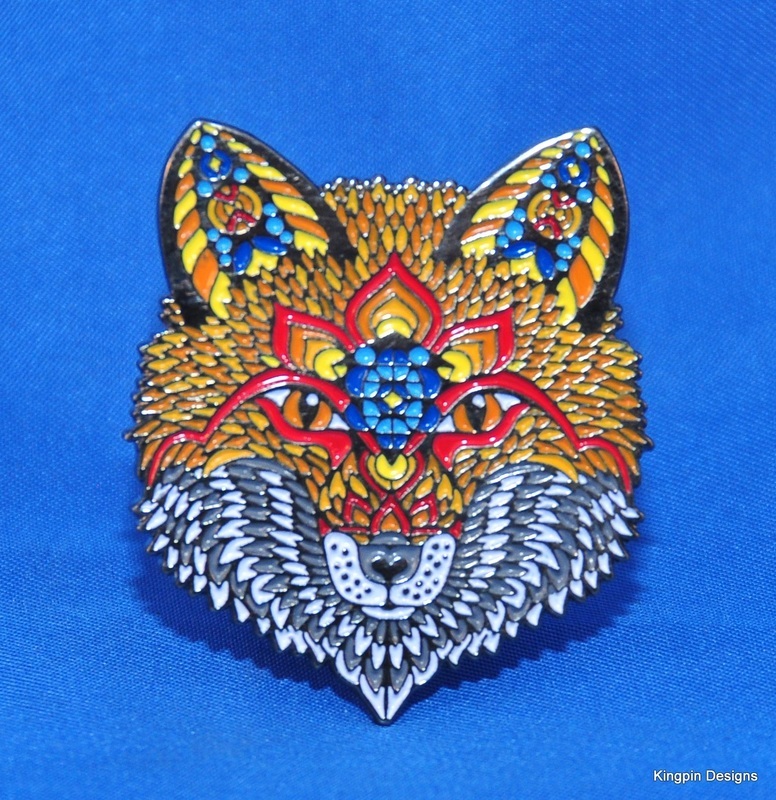 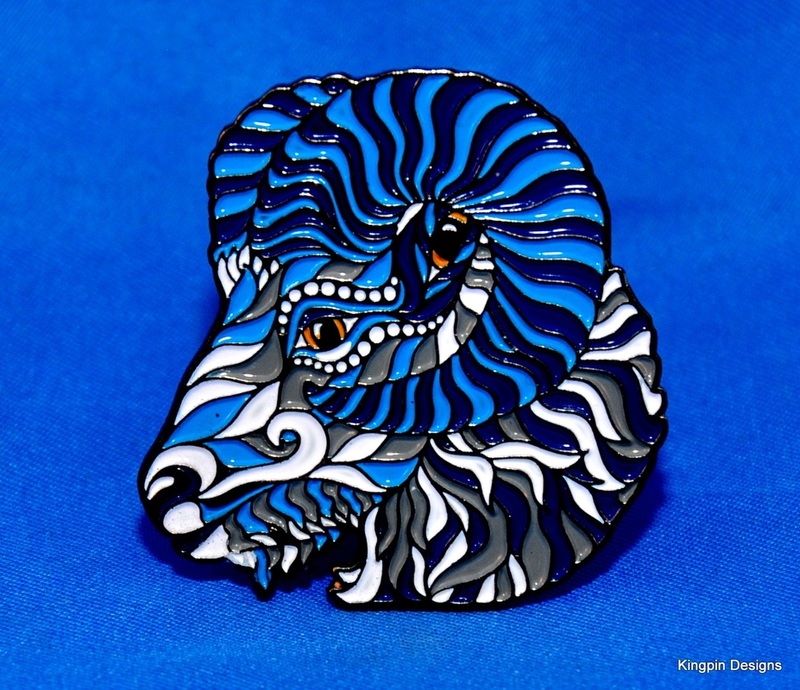 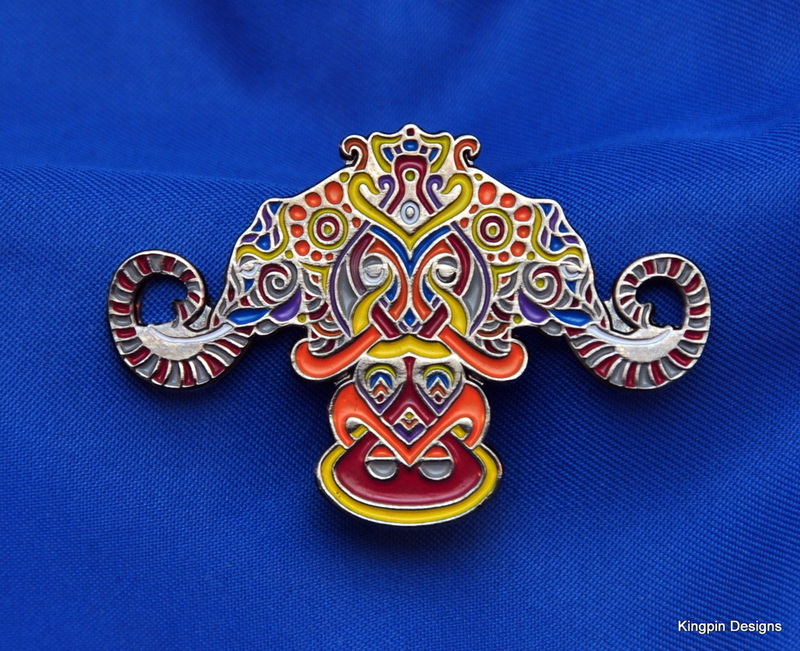 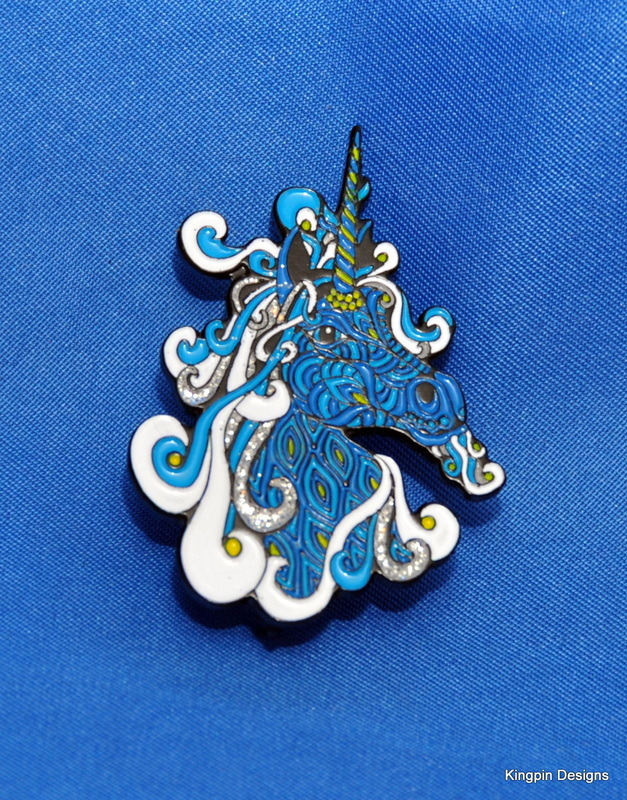 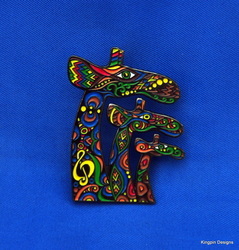 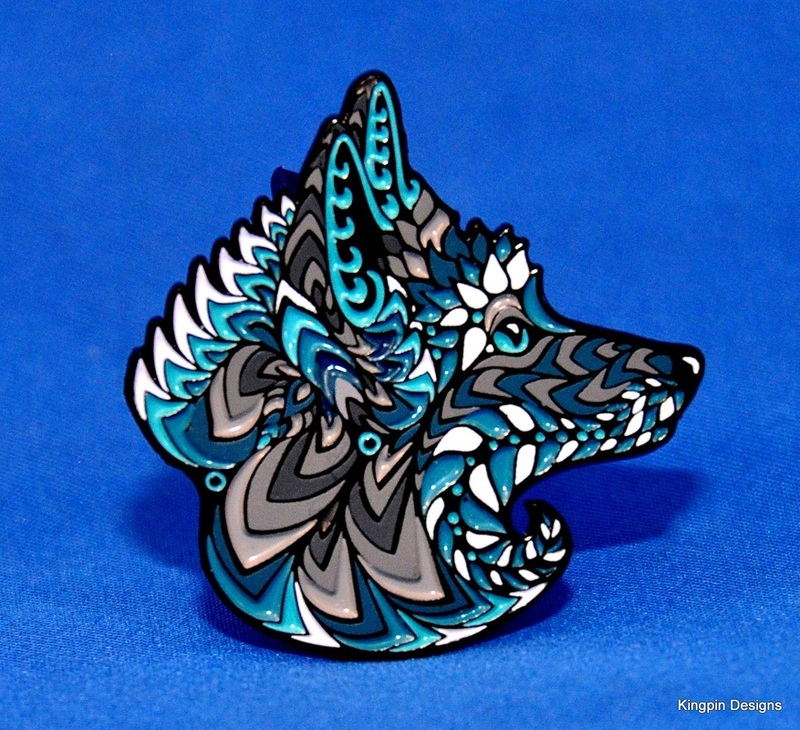 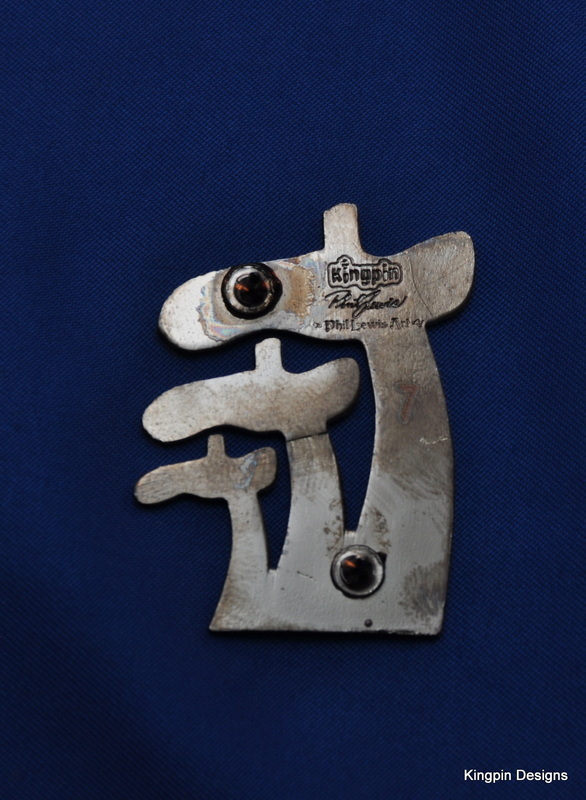 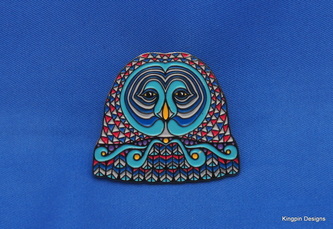 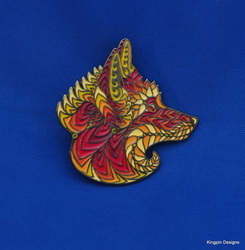 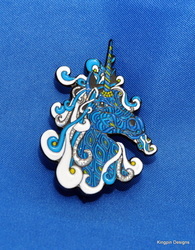 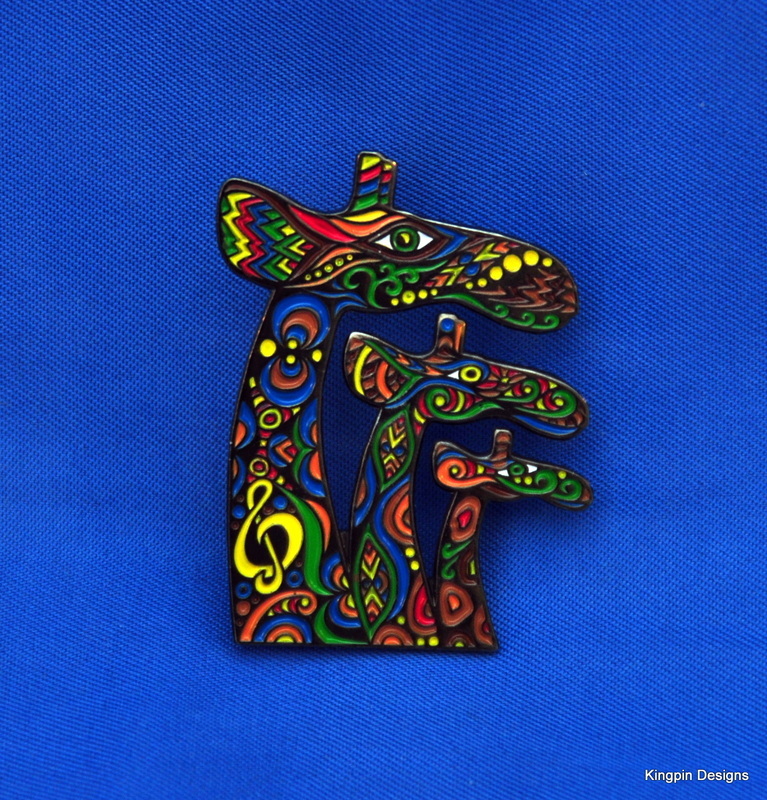 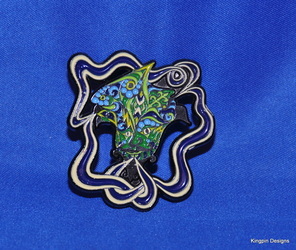 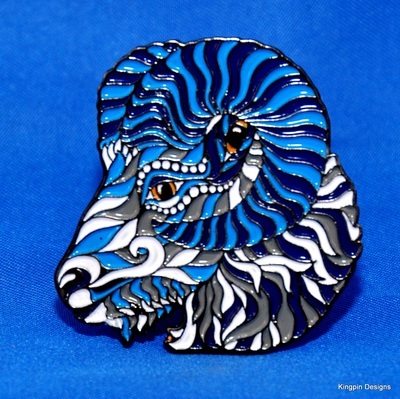 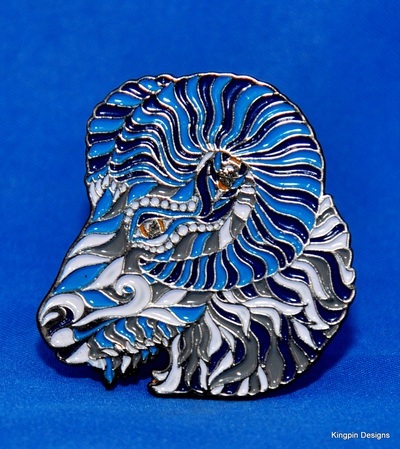 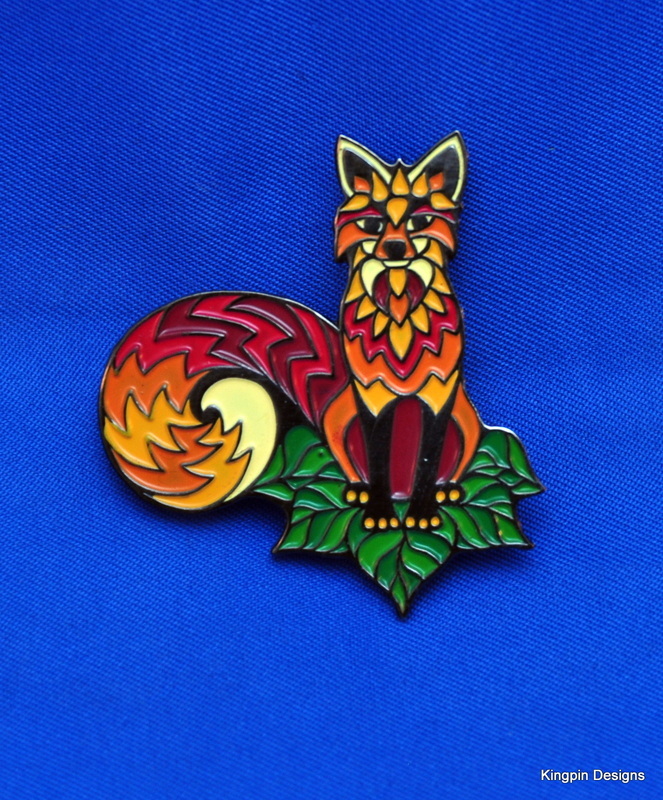 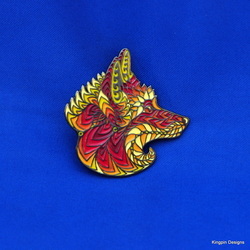 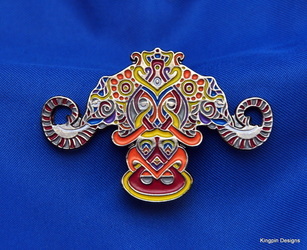 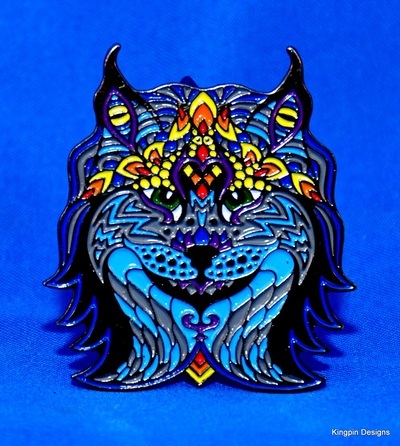 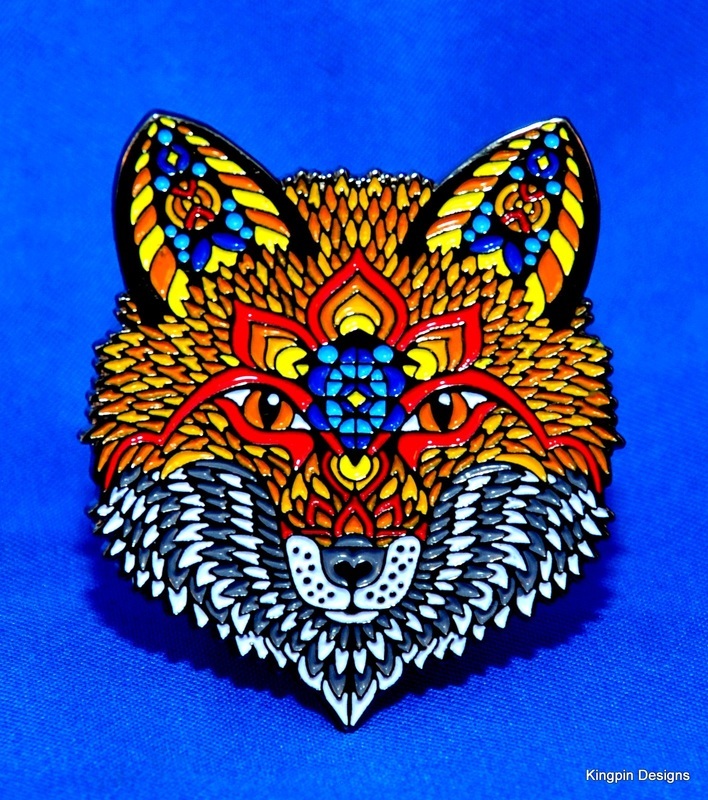 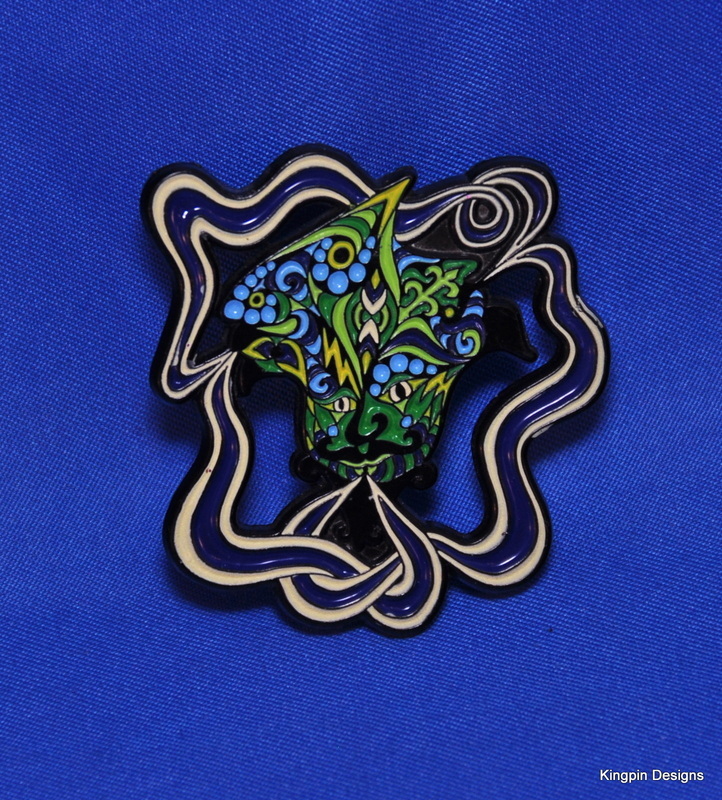 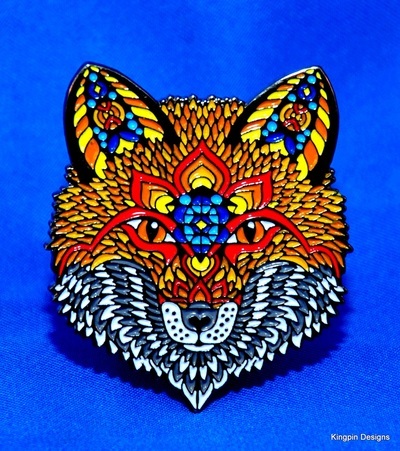 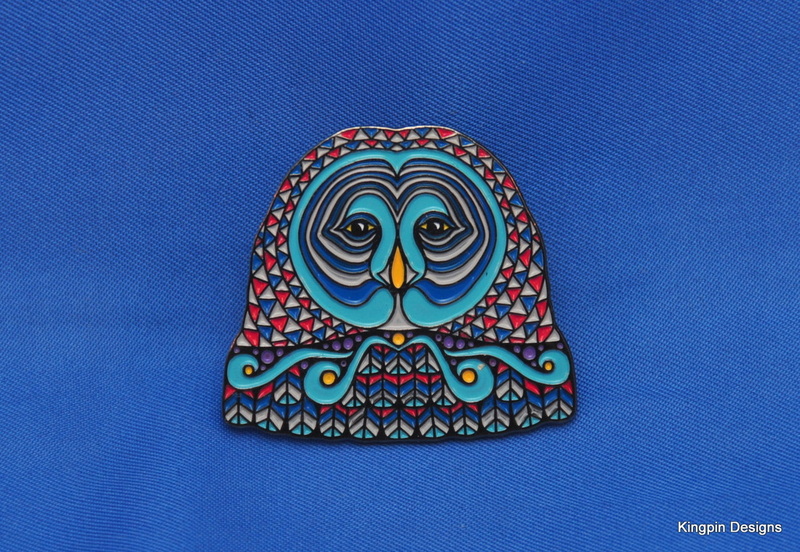 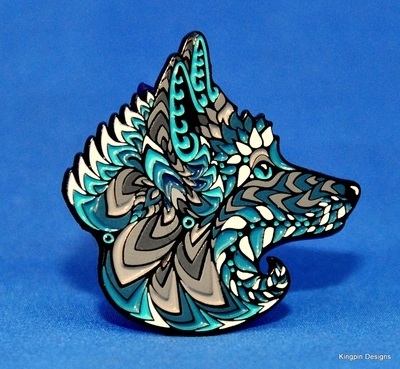 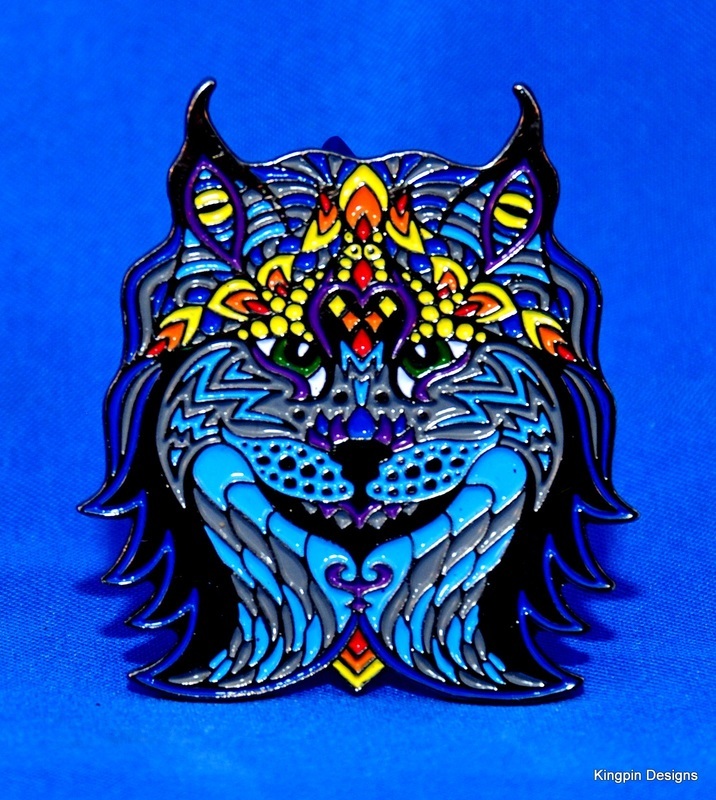 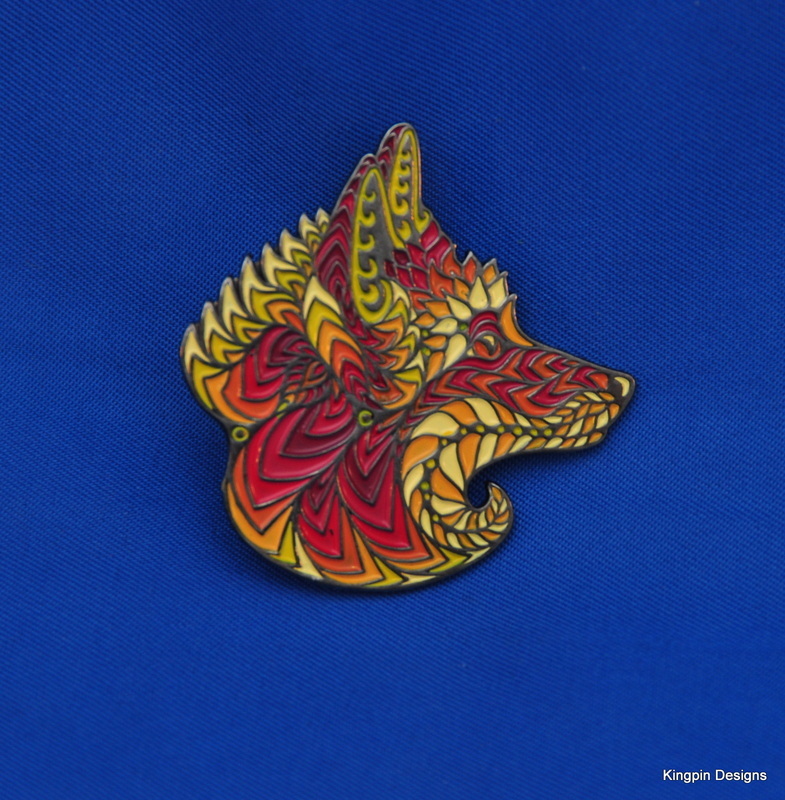 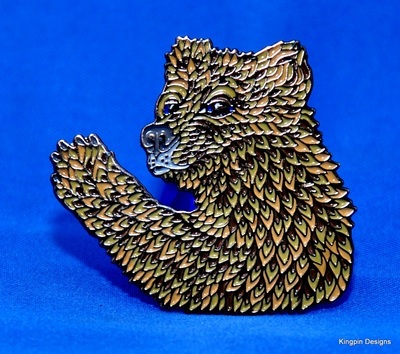 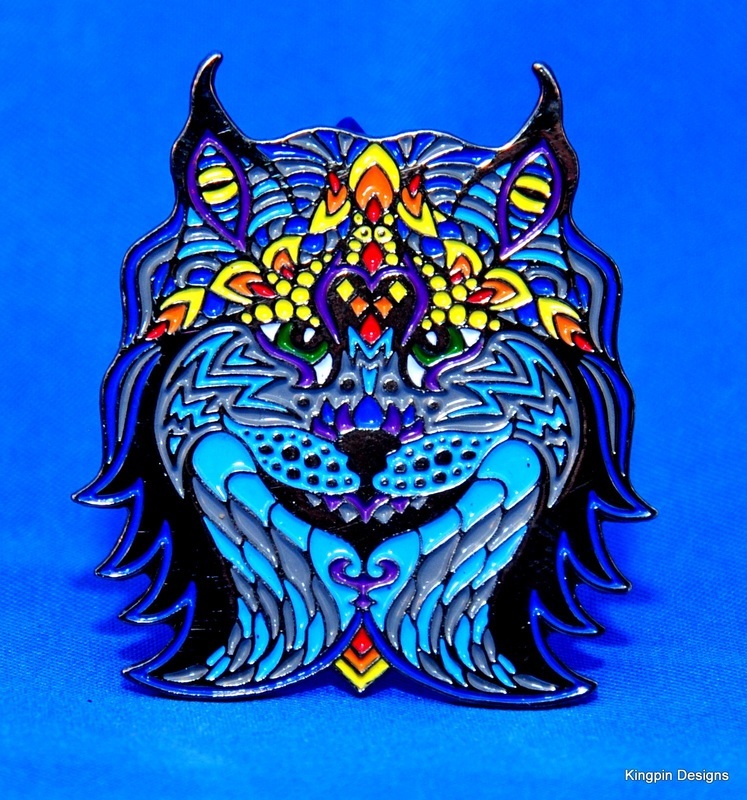 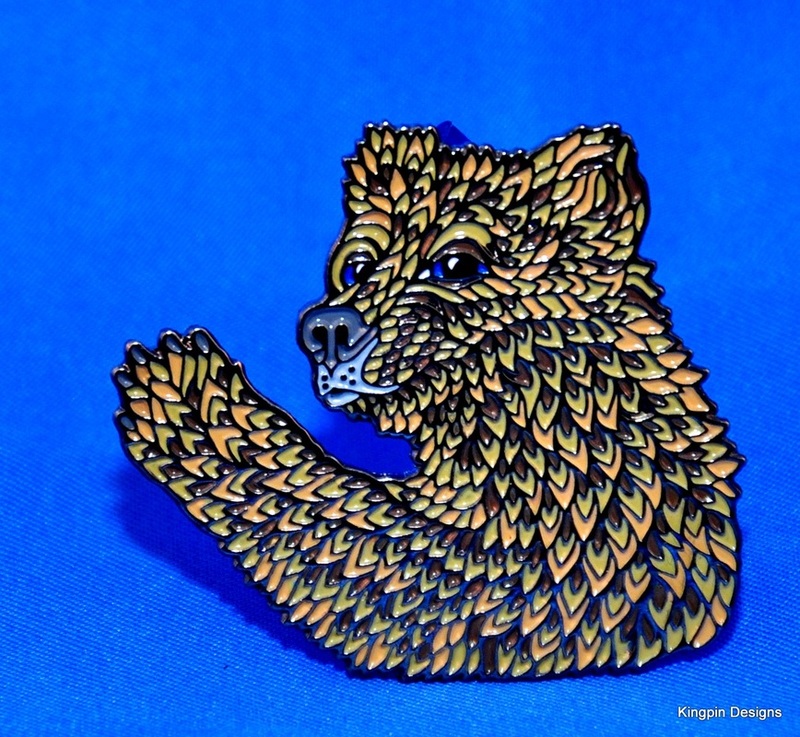 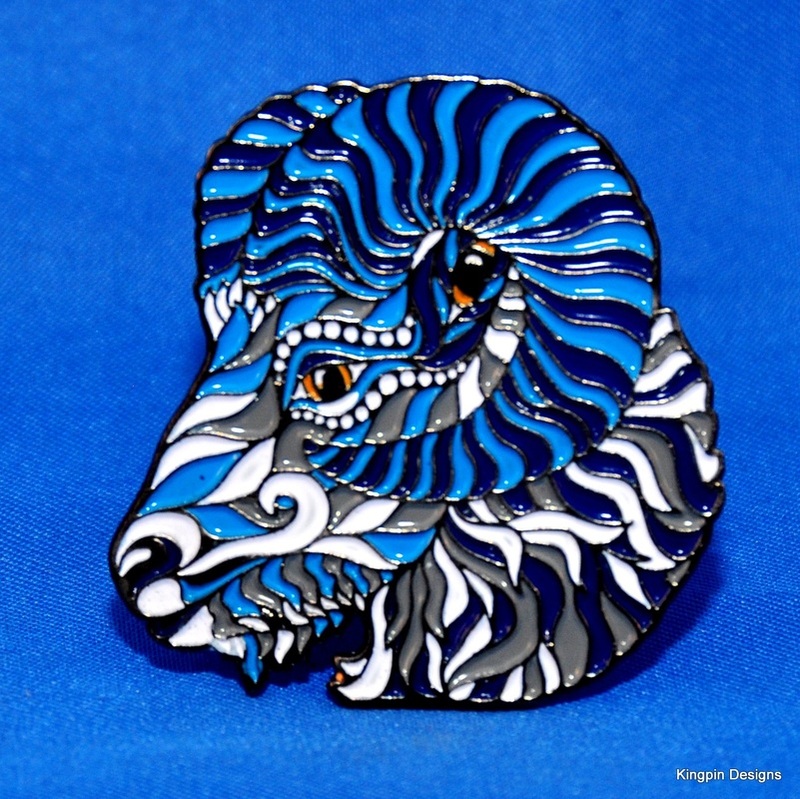 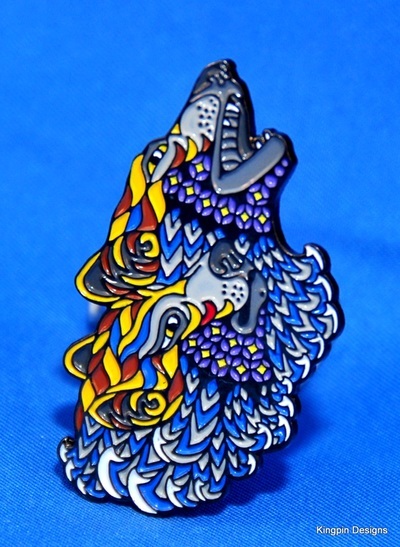 Buy all 3 Series of Phil Lewis's pins, including the Blue variant of the Foxy Face pin (released as a stand alone pin in 2014, see below for a picture), and save over 20%!! 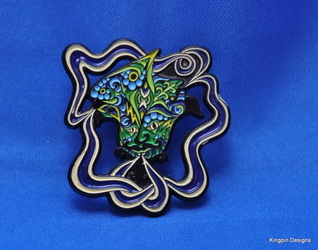 1 5/8 inches top to bottom, soft enamel, finished in polished black nickel, 2 posts, stamped with Phil Lewis's signature, the Phil Lewis Art logo, the Kingpin Designs logo, and individually numbered out of 400. 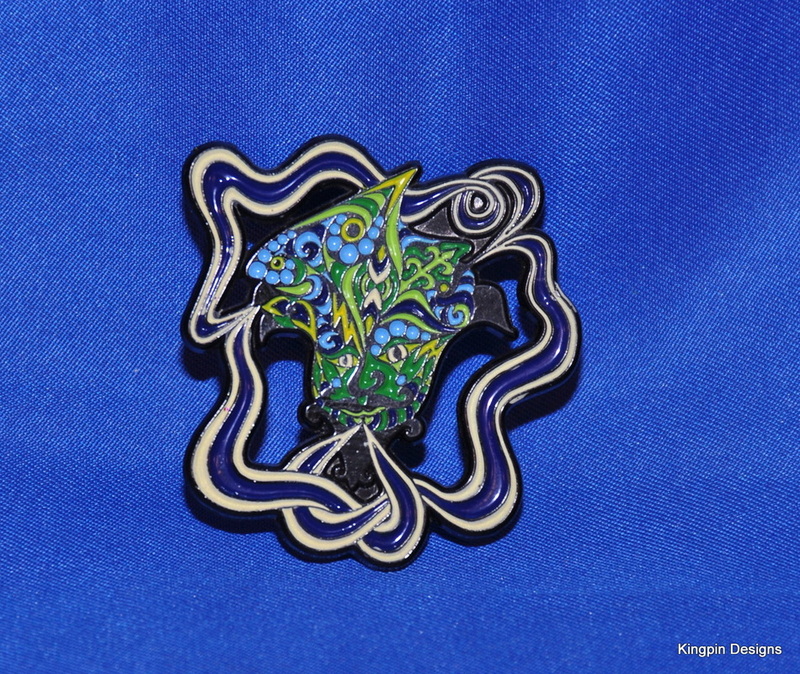 1.5 inches top to bottom, soft enamel, finished in polished black nickel, 2 posts, stamped with Phil Lewis's signature, the Phil Lewis Art logo, the Kingpin Designs logo, and individually numbered out of 400. 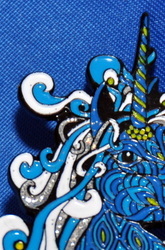 Silver glitter is used throughout the mane. 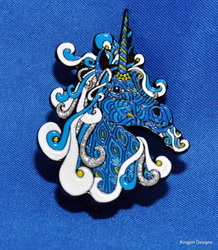 Light and dark blue glitter used throughout the water. 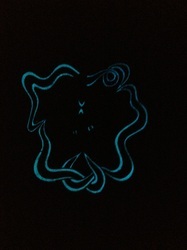 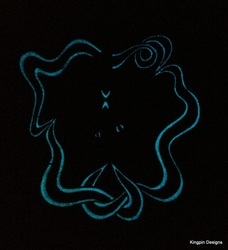 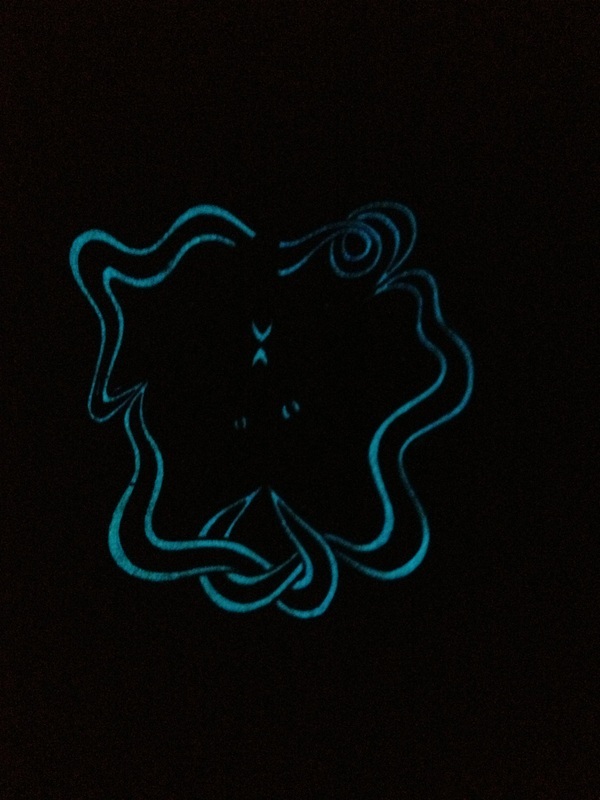 Glow in the Dark enamel highlights in the eyes, hat and smoke ring. 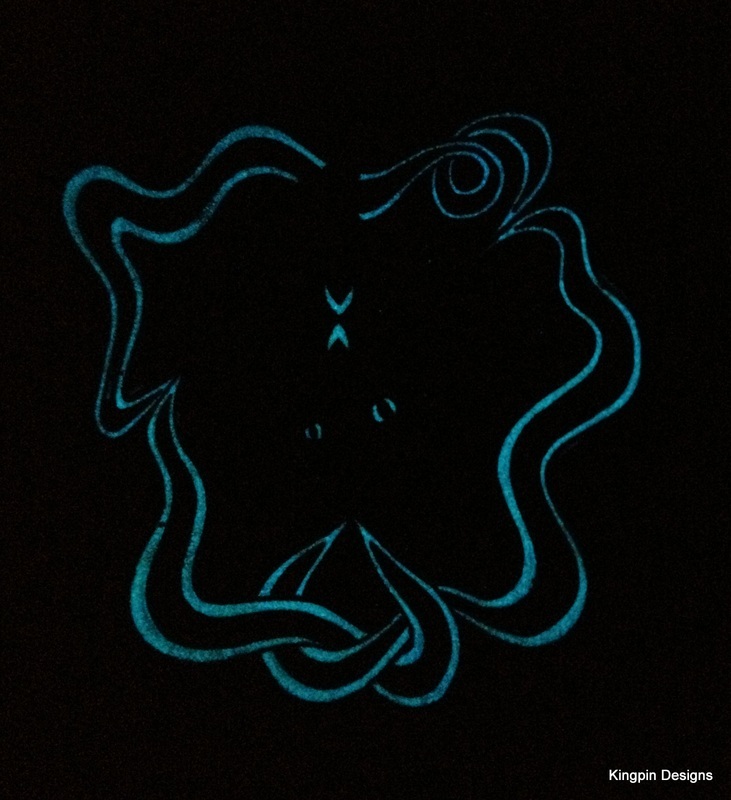 Glows blue! 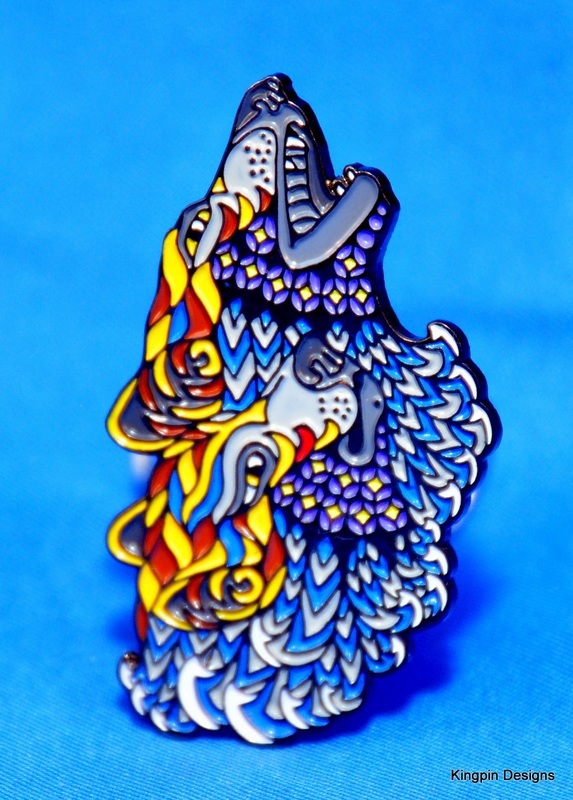 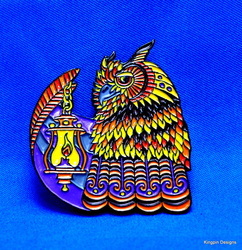 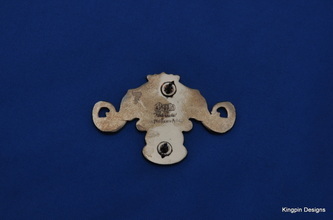 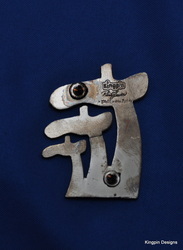 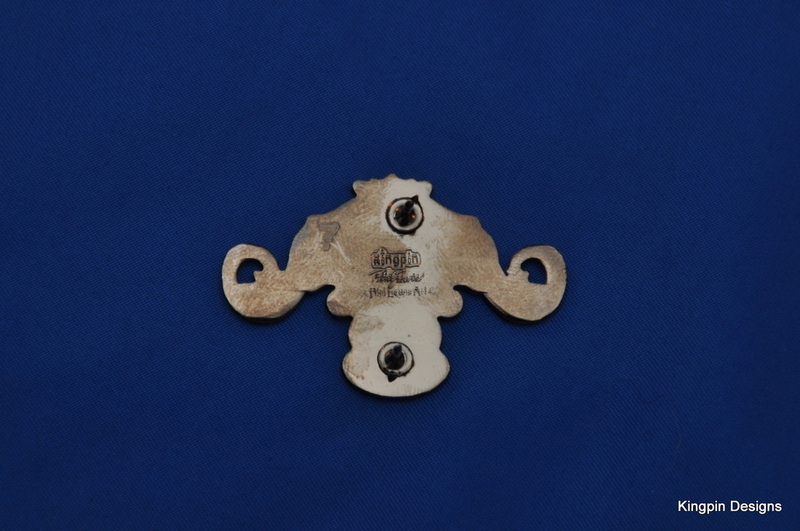 A Matched set of all 5 pins. 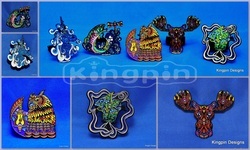 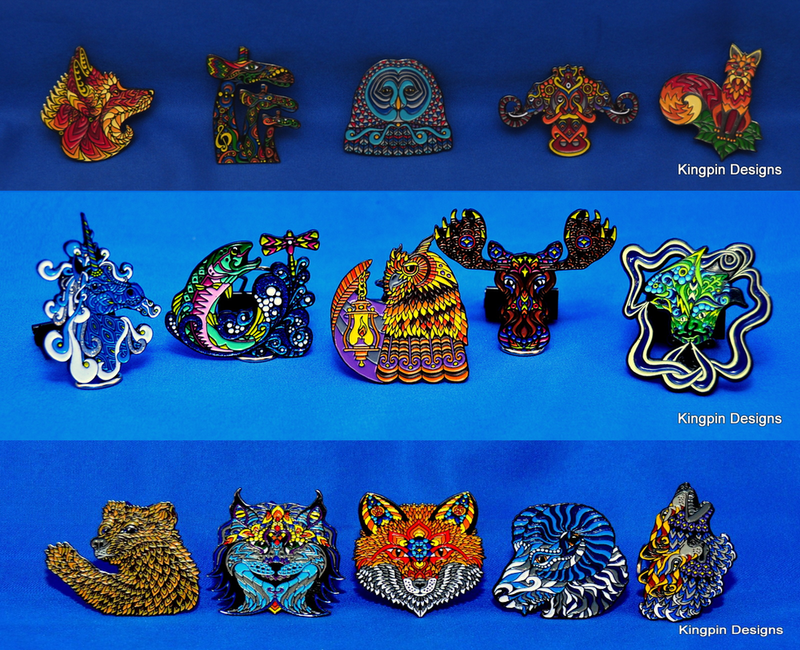 You get one of each pin,. 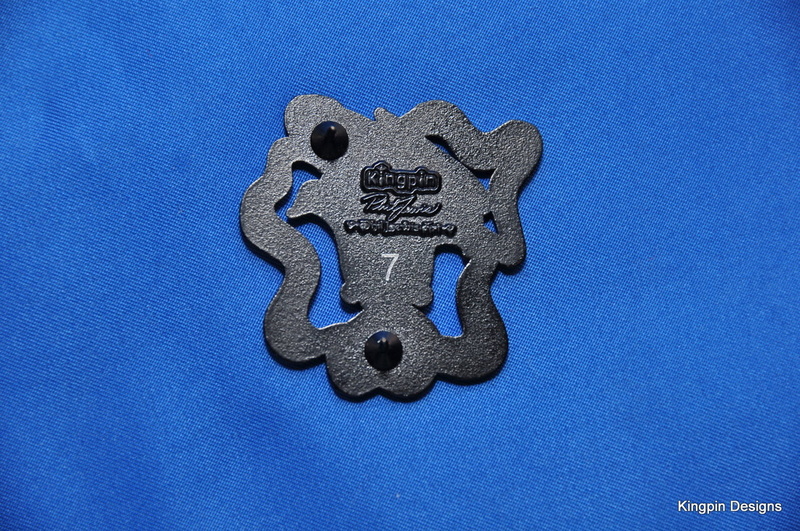 Also included is a certificate of authenticity for the set. 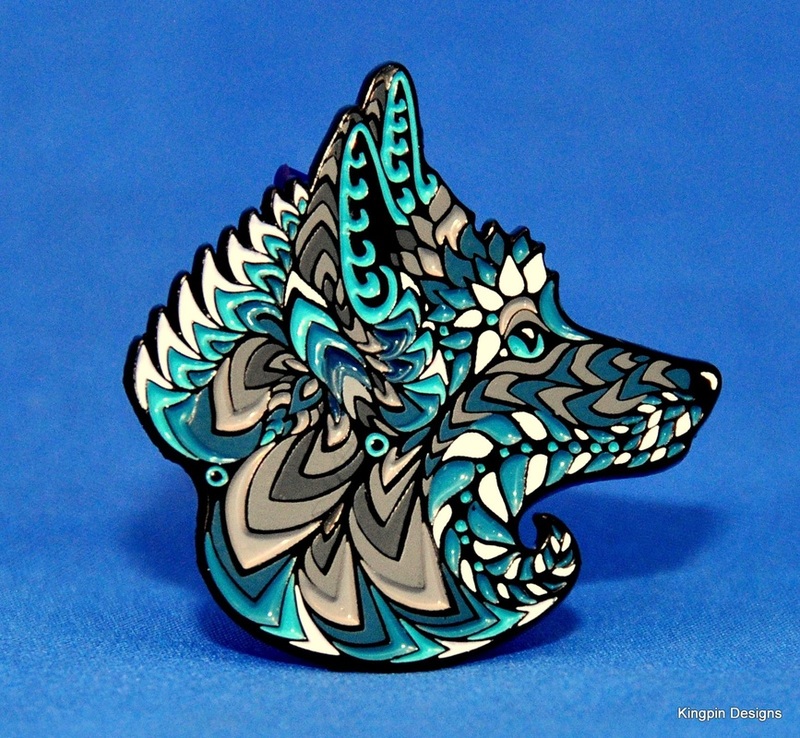 Buy the set and save $25! 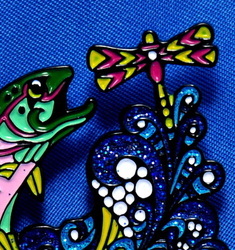 Note: Matching numbers for all pins is not guaranteed. The matching numbered sets have sold out! 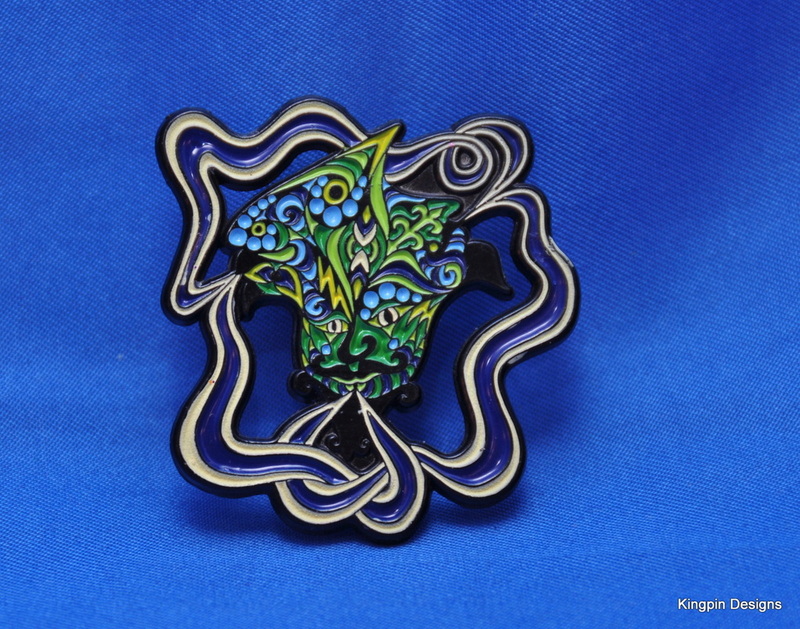 1 3/8 inches across the bottom, soft enamel, finished in polished black nickel, 2 posts, stamped with Phil Lewis's signature, the Phil Lewis Art logo, the Kingpin Designs logo, and individually numbered out of 400. 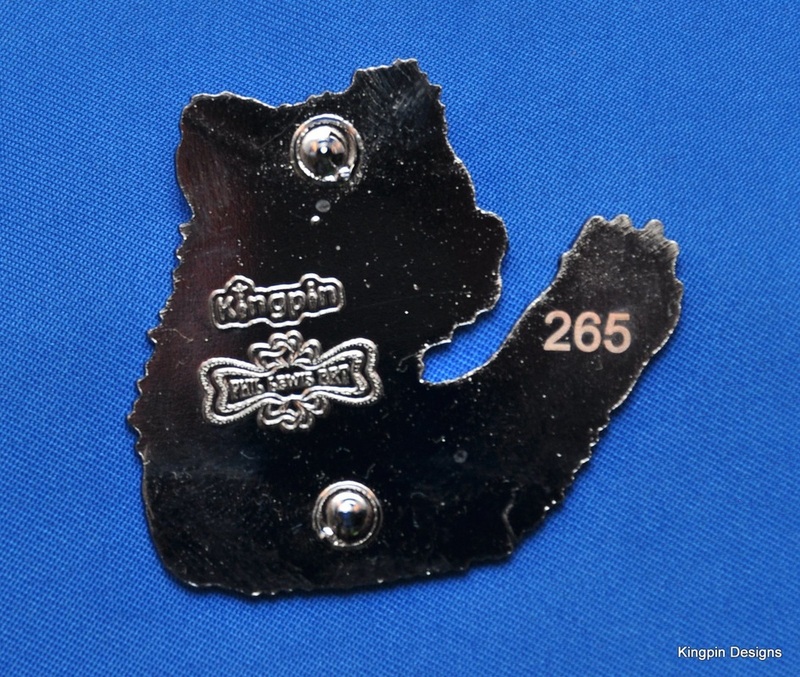 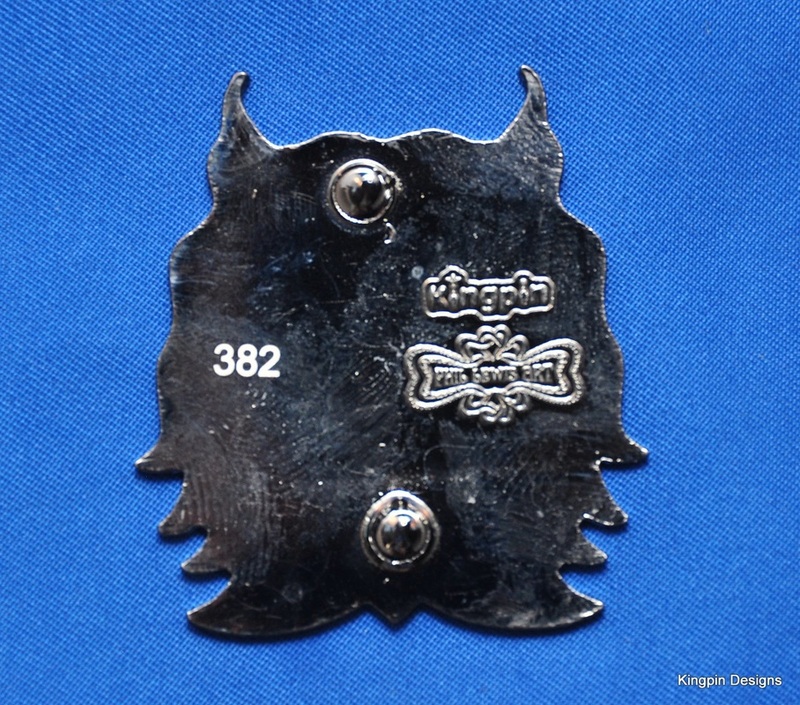 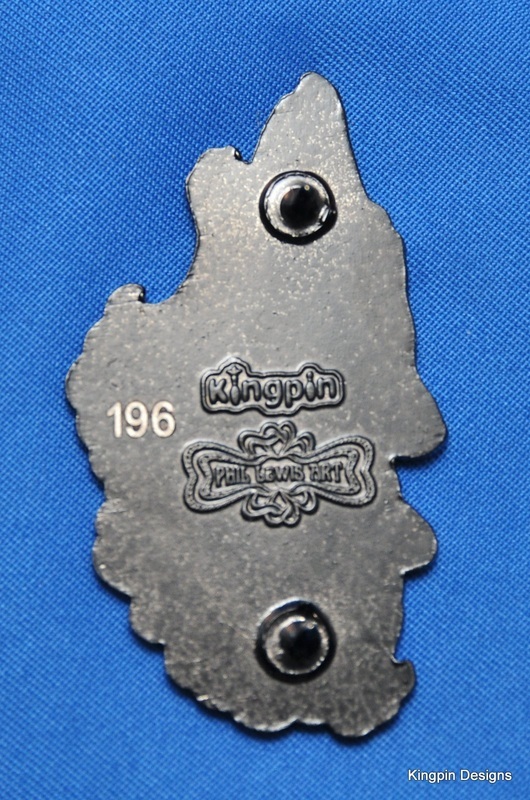 1.75 inches from trunk to trunk, soft enamel, finished in polished black nickel, 2 posts, stamped with Phil Lewis's signature, the Phil Lewis Art logo, the Kingpin Designs logo, and individually numbered out of 400.